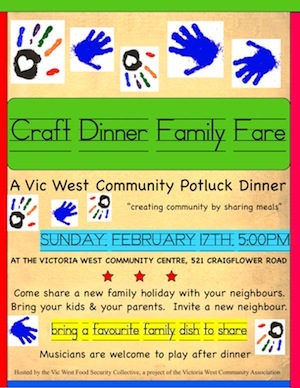 In celebration of our brand new break-the-doldrums holiday in February, the VWCA is welcoming families, couples and singles to our crafts and colours community potluck dinner. We supply markers and pipe-cleaners for each table and a paper-covered tables to go nuts drawing! Let your child, or your inner child, feast, draw and create. This entry was posted in Dinners and tagged community dinner, potluck. Bookmark the permalink.